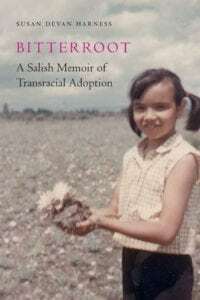 Just before I left for London last week, I was notified that Bitterroot: A Salish Memoir of Transracial Adoption had been chosen as one of four finalists in the Creative Nonfiction category of the Colorado Book Awards. I am thrilled and I am so very honored to be among this list of great writers with great stories to tell. When I began Bitterroot, in 2010, a finished product seemed so far away, so far in the future as to not be real. I began writing essays, which turned into chapters, which eventually became the book that was published by University of Nebraska Press in October, 2018. The memoir covers a life, my life, that is encased in so many identities: American Indian, transracial adoptee, rural Montanan, anthropologist, writer, wife, mother, sister and daughter, ‘real’ and ‘adopted’. It doesn’t take long to look back from this perspective and note that those dividing lines of identity have become blurred and faded as pieces of me move into and out of one another, slow turning eddies in a long, and at times, challenging river. Braiding these identities with history, policy and human relationship leads to an interesting story, one that has happened to so many American Indian children who’d been placed into white families, an informal assimilation project of the 1950s, 1960s and 1970s. Writing this book changed me in a very real and very core way. It allowed me to address the challenges of my life as well as explore my accomplishments. It allowed me to tell all those secrets that get pent up and made taboo because they might make someone feel uncomfortable. It allowed me to claim an American Indian identity, with all of the assimilation policies and historic trauma kneaded into it like bread dough. It allowed me a voice that is and will continue to be part of a larger conversation of our cultural beliefs and attitudes about transracial and transnational child placement and child welfare. Thank you University of Nebraska Press for seeing its value in this important social conversation. And thank you Colorado Humanities for choosing this book as a finalist for the Colorado Book Awards.